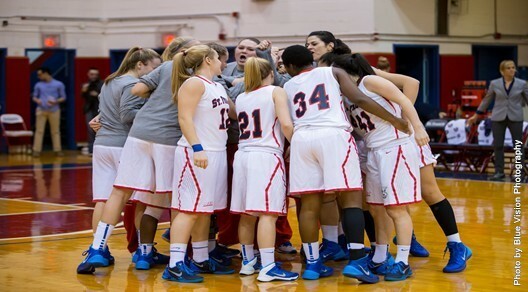 After a historic 2013-2014 season, the St. Francis College Women’s basketball team is headed to the 2014 Preseason Women’s Invitational Tournament (WNIT). Last season was a season to remember for the Terriers, this team racked up all sorts of accolades and even set a program record for wins in a season with 19. At one point during the season they were ranked in the Mid-Major Top 25, which was the first time in program history that they ever broke the top 25 in the Mid-Major poll. It certainly was a year of first for the Terriers and that trend seems to be continuing as they have been invited to play in the Preseason WNIT for the first time in program history. The WNIT is a tournament which show cases some of the best basketball teams throughout the country, teams who perform at a high level during this tournament usually go on to enjoy success throughout the regular season and into the postseason. 2013-2014 was a great year, but 2014-2015 the Terriers could be the year for the Terriers. This team took a huge step in the right direction with their memorable 2013-2014 campaign. This upcoming season can be even better, this team has the make-up to do bigger and better things then they did last season. The talent on this team is very serious and is only getting better with age. With the majority of their roster returning the sky is the limit for the Terriers in the upcoming season. The first step is to make their mark in the WNIT; if they can win a couple of games in that tournament they will show the nation that they can be a contender. This tournament is the perfect opportunity for this team to show what they are made of. No game will be easy in the WNIT; their competition will be some of the best teams in the nation. The other teams who have been invited to participate in the tournament are Albany, Arkansas State, Central Arkansas, Colorado, Eastern Kentucky, Jackson State, Mercer, Mississippi State, North Dakota, Penn State, Rider, Seton Hall, Towson, West Virginia and Western Kentucky. Like the Terriers, each of these teams are at the top of their respective conferences and are the cream of the crop in the nation. Round one of the WNIT will be held on November 14th and 15th; the tournament bracket will be available later this month. It is an exciting time for the Terriers as the present and future continues to look bright for them.